I've already ordered the M1T Raider, but before I order any more to test, I'm wondering if there's something I've missed? Everything else on the market seems to have a magnet or side switch or twisty switch or is too large, etc..., all of which I don't want. Thanks in advance for your thoughts and experience on these! Eagletac D25C, I particularly prefer Vinh's D25Cvn. Either of the White emitters or a HCRI option make for in my opinion, the perfect light. Thanks, yes, I've become a fan of Eagletac -- someone in this forum recommended to me the D25A during my search for AA flashlights, and I ended up buying it and am very happy with it. I'll look up Vinh and see what the D25Cvn might cost! But definitely leaning to the D25C in general right now as one of my options. I'll probably buy three (maybe four) CR123A flashlights total to test and just rotate through them and see which one wins out for me. As I mentioned, I've already ordered the Olight M1T Raider, and I'll probably order the Eagletac, but not sure of the third one yet. PK-PR1 is very small with a 2 way deep carry clip. Three settings, nice punchy beam. If you like the D25A I would think it is a simple choice myself? Or forget the tail switch and get something really small! And that is not even the small one! Oh and the PK is a really nice light too. But it also really highlights how slim the D25C is as well. Last edited by AVService; 04-16-2019 at 03:56 PM. @tech25 and @AVService -- thanks guys! -- that PK looks like it has an incredible clip, looks like a beast for sure, actually kind of aggressive. My other flashlights will feel intimidated by it. ;-) And I can't deny the slimness of the Eagletac is very enticing. So I just ordered the D25C Mark II! Can't pass it up since I already like the D25A. Thank you so much for the photos showing the relative sizes. Gives me a great point of reference since I already have the D25A. So for now, I have the M1T and the D25C on the way... I'd like to get one more for testing/comparison. :-) The PK looks awesome, but I think I want to go with a third option more on the compact side. 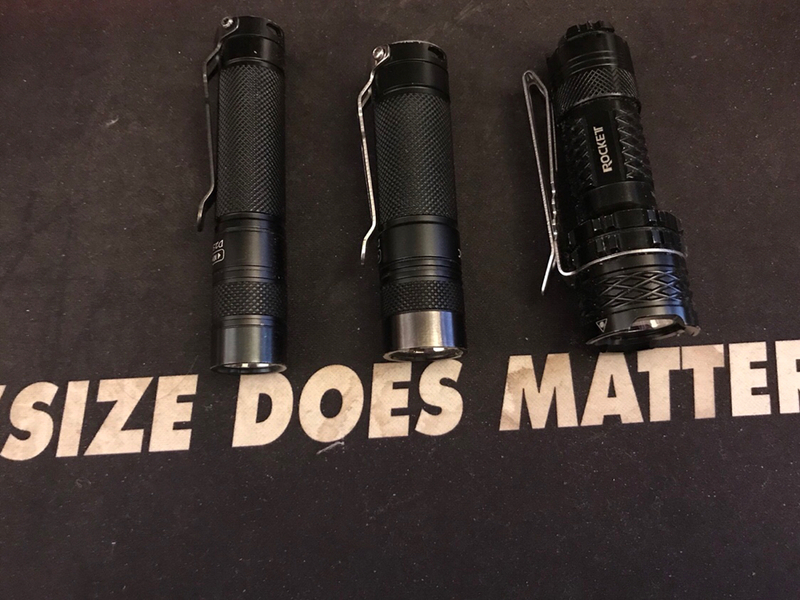 I think that also rules out the Nitecore P05 and the Streamlight ProTac 88061 1L-AA. So maybe my third option will be Klarus XT1C V2? Although, now that I look at the specs, it's also on the wider side. Plus the clip is not deep carry. Hmmm.... the other ones seem a lot thicker than the Eagletac. So maybe the Streamlight ProTac 88030 1L? That seems like a decent third option. Quick update -- I just ordered the Fenix PD25 as my third test flashlight. After some more research, the PD25 features actually look pretty good on paper, and the way the side switch works with the tactical tail switch might be a nicer combo than I originally thought. Worth testing. Also, it's a little smaller/thinner than some of the others on the list. 9 - TerraLUX TT1-EX - ??? conflicting size info, website down, apparently on the larger side??? I'll update this thread again when the flashlights come in. I have a feeling I'll be in good shape with #1-3. If I'm not happy, I might still buy the ProTac 88030 1L. But for now, I don't think the features of the 88030 get me anything over #1-3, plus the 88030 clip is not very deep carry. Let me know if there's any other flashlight I should consider! I hope you like the 3 you decided to order. I own and like both the EagleTac and Fenix. If you like the D25A, I think you will really like the D25c. It is pretty much the same light, just built around a different battery. It is my wife’s favorite flashlight. As you mention with the PD25, I think the side switch with tail switch works nice. Thanks, @Sos24! Glad to hear about your experience with the PD25 and D25C -- I also think those will be my favorites. 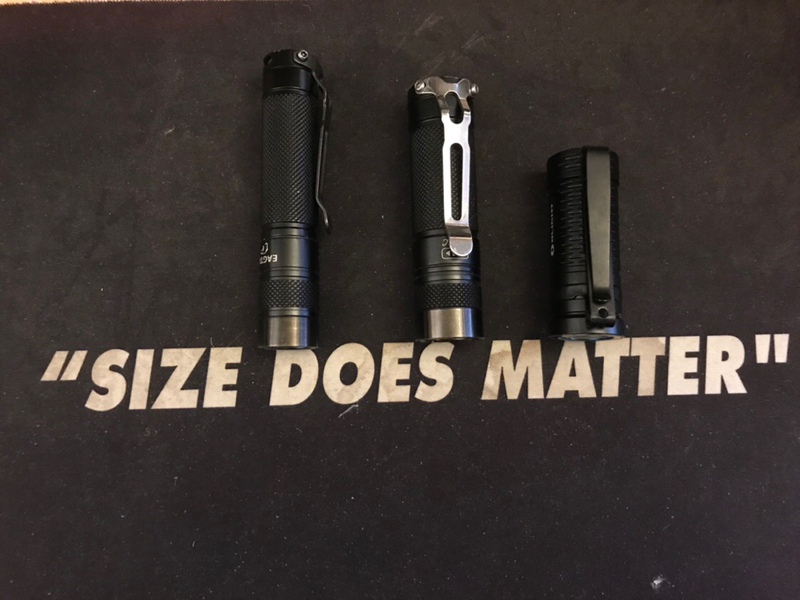 BTW, I think I might have made a mistake ordering the Olight M1T Raider... I just found out that apparently, the version I ordered has the user interface that goes Hi -> Lo. I was assuming the order was Lo -> Hi like its little brother, the Olight i3T, which I like a lot. From what I've read, the US version of the M1T was changed from the original version that actually had Lo -> Hi. And now, in the US, the Lo -> Hi version is called the M1T "special" edition. Same price, harder to get in the US, but it has Lo -> Hi and a different, smooth blue bezel. Not sure my version will be worth the hassle to return/exchange, etc... but I think the "special" edition would have been better for me. 1 - Fenix PD25 - So this one surprised me and has jumped to the #1 spot. I really like it so far. The combination of ergonomics, features, build quality, spacing, etc... make a great CR123A EDC. I need to do more testing, but so far, I'm a fan. I didn't expect to like the combo of tail+side switches as much as I do. It's logical and natural to operate, actually more natural and intuitive than the EagleTac tail+twist UI so far. But time will tell. 2 - EagleTac D25C MK II - Close second. While I'm a fan of EagleTac in general, and my D25A is my favorite 1xAA flashlight right now, this D25C just falls slightly short of the PD25 for me. Now there's no doubt it's a great flashlight and it's more compact than the PD25 with more features, but for me, it turns out that the more compact size and clip design are actually working *against* its usability for me and my pocket... the dimensions don't work as well for me as the longer and more slender D25A... and even though the PD25 is larger, it still disappears into my pocket just fine... this D25C strangely tends to pop out of my pocket more and I'm not a huge fan of the clip either. IMO, the AA variant is a little better, even though this CR123A variant has more power, etc... Anyway, it's a superb flashlight, but for now, it's edged out by the PD25 for me. 3 - Olight M1T Raider - This is in third place due to its comparatively limited feature set, but it's a great simple flashlight. I've also ordered the "special edition" version that has the Lo -> Hi modes in the UI, which I think will work better for me. But even with a Lo -> Hi mode, this would still be in third place... it's hard to beat the D25C and PD25 IMO. Thanks guys! I'm pretty happy with these, looking forward to rotating these in with my 1xAA and 1xAAA EDC flashlights as needed.